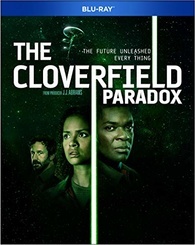 GenreOnline.net: Win a Blu-ray Disc Copy of The Cloverfield Paradox. Enter Today! Win a Blu-ray Disc Copy of The Cloverfield Paradox. Enter Today! I am giving away two Blu-ray Disc copies of The Cloverfield Paradox two two winners selected at random. Just email me a a United States mailing address to GenreOnline@gmail.com. Put Cloverfield Paradox in the subject line and enter. The deadline is Wednesday, February 13th 2019. Good luck!